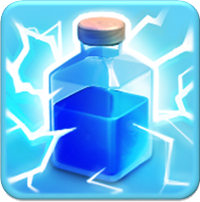 The lightning spell is the first spell that you can build if you have a spell factory. This spell drops lightning bolts to the place where you deploy it. It splash damages the space around the hit area with 3.5 tiles. The most damage is done to the center of the lightning spell. The spells cost relative much elixir (15.000 to 24.000) but can help a player out if needed. It takes 30 minutes for the lightning spell to produce. If used with the giant-healer strategy it is effective to take out air defenses (minimal 3 lightning strikes required). They also work well against defensive buildings. It is handy top keep a few spells during attacks, sometimes you need to destroy just one more building to achieve 1 star. The lightning spell can help you out. A lightning spell is extremely effective against enemy clan castle troops during an attack. A lot of people use the lightning spell to steal dark elixir. They just attack the dark elixir storage with a few spells to collect it.